The level of organization in the neighborhoods surrounding the airport in Santa Monica continues to be impressive. This is not surprising, though, as the fight for local control over their local airport has been going on for more than THREE DECADES! The latest progress includes a push for the City Council to “…close the Santa Monica Airport to aviation use, as soon as that is legally permitted with a goal of June 30, 2018 and earlier if possible….” In support, a local Facebook group, SMOfuture, has created an 18-page factual summary of airport data that supports the closure proposal (a scrollable PDF copy is viewable at the bottom of this Post). Take a look at the graphs in the report. There has been a lot of change in three decades. Some of the original impacts have all but disappeared. The main remaining airport impacts are the most severe, and are caused primarily by air charter jets and flight training pattern work. The flights that create the worst pollution – including added pollution at LAX due to delays – are the IFR departures. These are commonly charter jets and business jets, frequently carrying only one or two passengers. Each of these flights creates an enormous carbon impact per passenger mile, all for the ‘convenience’ of that small passenger load. None of this is necessary, and KSMO offers no tangible benefits to the larger ‘National Airspace System’ (NAS). If an airport closure happened, flights using Santa Monica Airport would easily be absorbed at LAX, Burbank, Van Nuys and Hawthorne. The capacity at these other airports is far beyond the current usage. Indeed, as shown in the scrollable PDF below, everything has declined substantially at all Southern California airports, with the vast majority of airports seeing declines between 40% and 60%! The declining parameters include number of based aircraft, number of pilots, and number of operations per day. The only ‘growth’ at KSMO is in commercial flights, for air charter. That these health impacts and other problems persist is testimony to how entrenched FAA is, in a position that consistently protects elite airport interests, delaying any and all meaningful action. At this and other airports across then nation, locals are disgusted at this ongoing FAA failure. Adding insult to injury, the bulk of this poor performance by FAA is done using the Peoples’ money, primarily from airline passenger taxes. SMO Future – a Facebook group, advocating to reduce airport pollution, noise, dangers, and costs, and seeking a better future use of the airport land. The number of jet operations per year, in and out of the airport at Santa Monica [KSMO], was barely 1,000 in 1983, and peaked at around 18,000 from 2004-2007. There was a substantial decline coincident with the financial collapse of 2008, and jet operations bottomed out below 13,000 during 2010-2012, before climbing back to 15,000 in 2014. FAA’s records indicate there are only 6 or 7 jets actually hangared at KSMO. In fact, much of the jet traffic at KSMO is on-demand charter jets, often flying relatively short distances to Arizona, Nevada, the Rockies, or the Bay Area. The on-demand charter jets also frequently fly repositioning hops between KSMO and the three closest airports: KLAX, KVNY, or KBUR. Thus, a 6-mile or 8-mile direct trip becomes 50-60 miles of flying, mostly at altitudes no higher than 5,000 feet. The noise, soot, and other pollution impacts are substantial. And, as close as the houses are to the runway at KSMO, these jet operations are certainly not good for the health of local residents. Below are aerial views showing the approaches to the two runway ends: Runway 21 (the primary runway) facing towards the ocean, and Runway 03 (used far less frequently) facing away from the ocean. These images are copied from a November 2011 presentation by Martin Rubin, Santa Monica Airport & Public Health. 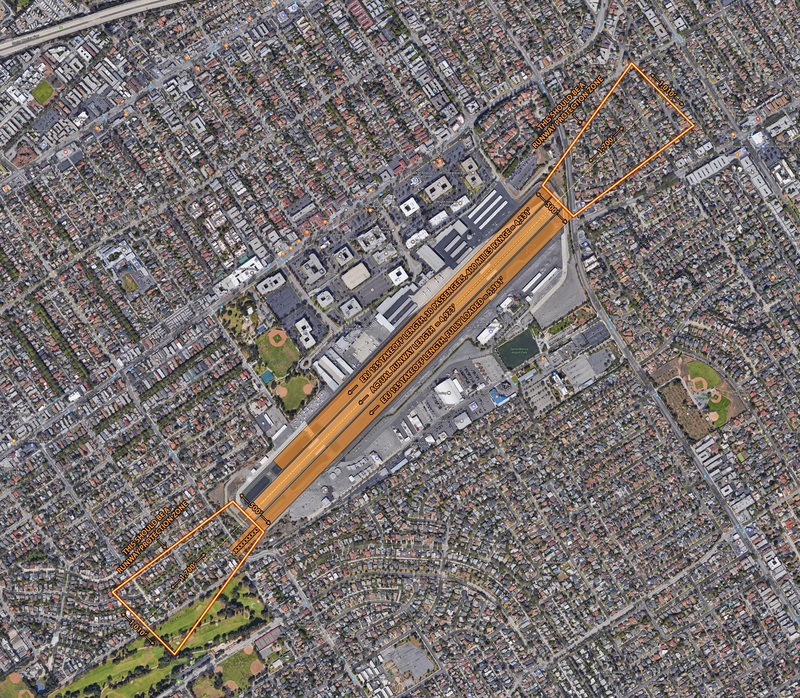 Given the dense residential development close-in to the runway, air charter service to the Santa Monica area would be more safely and efficiently handled out of KLAX, KVNY, or KBUR. All three of these other airports offer much longer runways as well as multiple runways, so they can safely segregate faster jets from slower recreational aircraft. Plus, at all three airports, the controllers regularly work steady jet flows. 1984 Airport Agreement Between FAA and Santa Monica — this is the agreement set to expire this year, enabling the local government to regain control of their airport. The graph above was prepared by Martin Rubin, co-founder and web administrator for Concerned Residents Against Airport Pollution (CRAAP).